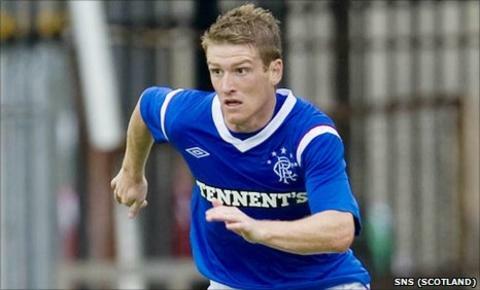 Rangers midfielder Steven Davis has signed a new five-year contract with the Ibrox club. The Northern Ireland international follows Steven Whittaker and Allan McGregor in committing his long-term future to Ally McCoist's side. Davis, 26, first joined Rangers on loan from Fulham in January 2008 and made a permanent move later that year. He was about to enter the final year of his existing contract but his new deal runs until 2016. Davis arrived at Ibrox on loan from Fulham in January 2008, helping the club reach the Uefa Cup final. The former Aston Villa midfielder signed for the club on a long-term basis months later and has won three consecutive Scottish Premier League titles since. The news, announced on the club's website, comes after goalkeeper McGregor last month signed for six years and full-back Whittaker for five years. Rangers director of football Gordon Smith last week revealed that defender Madjid Bougherra, who is also entering the final year of his contract, was open to discussing an extended stay.